Tanning has become a must do in many beauty bloggers lives, and with SO many brands and types to choose from it can be a bit overwhelming. I have heard lots of talk about Boni Sands and as its easily accessible to me I thought I would give it a go! First application: I purchased the foam in "dark" so for my first application I was cautious as to how long I left it on for. The instructions state that the skin can be washed after ONE hour, or up to 6. I decided o leave it on for 2 and a half hours. 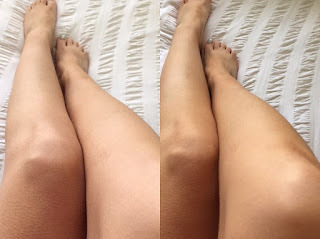 When I was applying it I noticed that it had a lovely coconut scent to it that takes away that well known "tan smell"
I unfortunately didn't take any photos of my first application, but once washed off after the 2 and a half hours it developed into a beautiful natural tan! I was about 1-2 shades darker than I was to begin with, which I was happy with! I would normally go a bit darker so now I know I know i can leave it on for a bit longer. Second application: I took photos this time! I applied the same amount as last time, however this time I left it on over night! It dried quite quickly so I didn't feel sticky going to bed. When I woke up I realised that my hands were orange from the tan, obviously my toothpaste trick didn't work this time! It was even all over and still very natural looking. Im pretty happy with it! The only thing I might do different next time is happy a second coat once the first is dry and see how dark I can get it, and invest in a tanning mitt! Comment below and let me know where you can purchase it from!